During Fridays visit we finished checking every thing that could be checked. Grr as my favourite hitch-hiker says! Bob came out of the engine room and this time he started the engine to see if we had done any good. Engine started and I mentioned to Bob that the water under the exhaust didnt move and there was no smoke coming out. I dived into the engine and disconnected the exhaust. Started the engine and away it went with smoke every where. It seems that the exhaust was blocked enough to let the engine run but not enough to speed up. I dismantled the system and the box looked fine and I could put a pole through all the pipes so they were clear. The only bit that left was the box itself. Over the weekend Bob picked up exhaust box and took it back to the workshop. Going much further than can be expected of him he then brought it back on Sunday morning for me to reconnect. The box itself seems to be rather complicated inside and absolutely no way of getting inside to check it out. Bob cut it up and the problem was the small holes through which gases go. They are not small any longer!! Blown through with high pressure air and welded back together it now works perfectly. 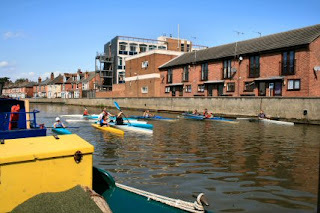 On Sundays on the canal the kayaks come out. As many as four times during the day there are large numbers of children really enjoying themselves. In the picture they are starting to line up for a race to the road bridge. Monday morning - early - I reconnected the exhaust and all the other bits and pieces. By the time I finished Bob arrived as he was as interested as I was on how it would go. We were expecting loads of black smoke but as you can see there was very little evidence of a problem. I am now at Saxilby for fuel and water. I meet a large number of lovely people while I was stuck at the Uni. 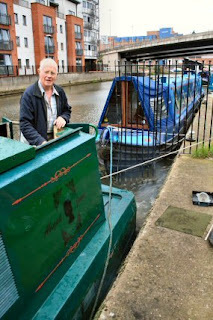 It became embarrassing when the helmsman of the Brayford Belle would hang out of the bridge and ask about the engine. The last people to arrive had recently moved to Blue Water Marina - the home of Lady Piper that was. I hope that I will be able to keep in touch with one or two of the nicest people I know. Conngratulations - I feel that I have lived through this with you!